Here you will find and explanation of an SEO breakdown. There are three main sections to understanding where your placement is when it comes to SEO. There are companies that pay-per-click, which means every time you click on their link or page, they pay for that. Also, the middle section is for Google Local. It lists the business' names, phone numbers and addresses. Below this section, is the most important when it comes to the success of your SEO and essentially where we come in to play. 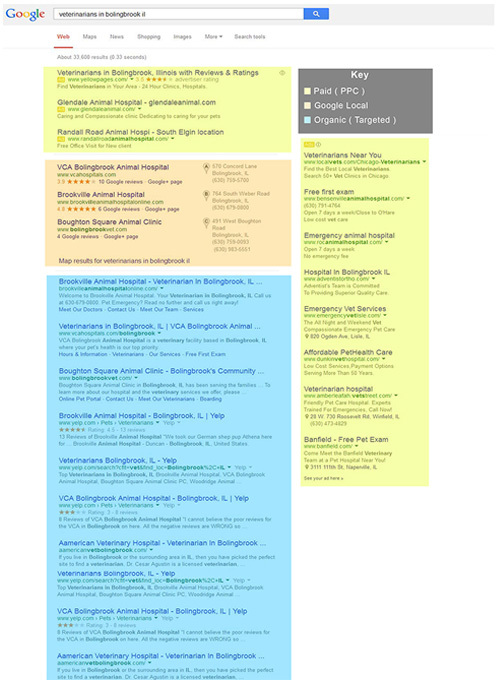 These links and pages below the Google Local section is all organic searches. Once you have typed your search these are links and pages pertaining to your key words that you typed into the search engine. These clicks for links do not cost anything, which is great for businesses. You pay nothing for that click but gain traffic to your site. Now, how to get your page to that organic section within the first couple of links? Making sure you have the right descriptions with key words that are being searched, Meta tags, proper search optimization, inbound links and getting acquainted with Google Analytics. These are all steps into making your way to the top of the organic search section. Not sure how SEO works or need further explanation? Or maybe you just don't have time to do proper SEO, either way we can help change or increase your search engine optimization for your company. Let one of our sales reps know if you need further explanation or help getting started. We can increase your websites visibility in search engines by optimizing your site. This will raise your rankings across search engines and increase your traffic for targeted keywords. Internet Marketing packages are an annual service, as search engine algorithms continually change and adjustments are performed regularly to maintain the highest possible visibility. Different packages are designed to address levels of competition for a specific market.